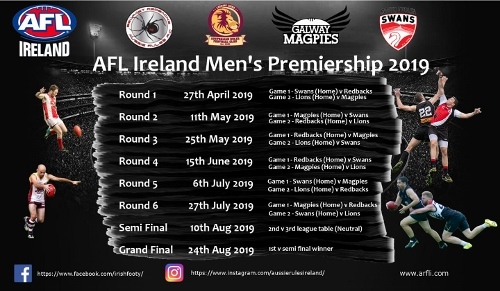 The season will open with the South Dublin Swans hosting the reigning premiers (and this weekend’s Champions League runners-up) the Belfast Redbacks. In Cork, the Leeside Lions host last season’s grand finalists the Galway Magpies. The season will feature six rounds before semi-finals on 10th August and the grand final on 24th August. Early season favourite will be the Belfast Redbacks after taking the 2018 title. However, the Galway Magpies will be keen to prove their form in 2018 was no flash in the pan and take the next step to a flag in 2019. The Leeside Lions will also be out to redeem themselves after a disappointing season last year. The South Dublin Swans could surprise everyone, staying relatively quiet behind the scenes and hatching their own plans for 2019.